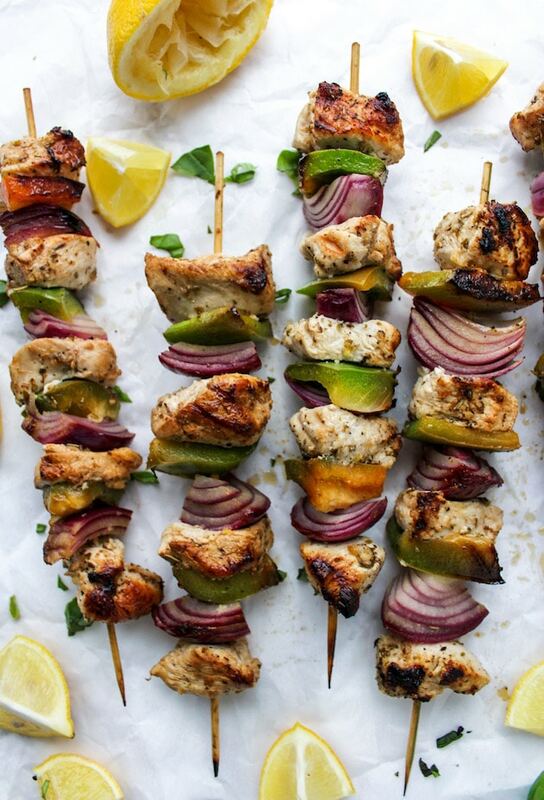 These Greek Lemon Chicken Kebabs are unintentionally the second food-on-a-stick recipe that I’m bringing to you this week and I’m not mad about it. One bite of these and I doubt you’ll be mad about it either. Unless maybe you don’t do meat in which case….what are you doing here, friend?? The first food-on-a-stick recipe was these Italian inspired antipasto skewers. Today we’re going to another part of the Mediterranean that I’d love to visit one day with this Greek inspired lemon chicken. 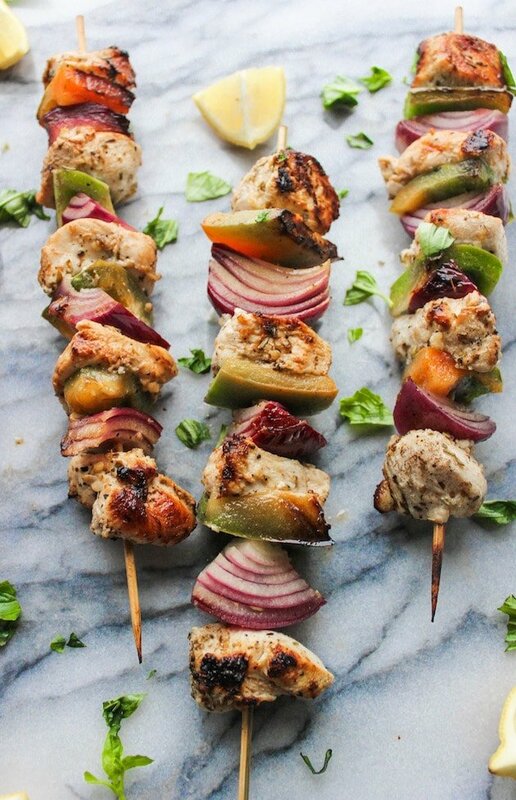 As far as Kebabs go this recipe in particular is especially easy. The marinade consists of nothing too pricey or exotic. Just mix those together in a bowl or zip lock bag along with your chicken pieces and give your poultry a little time to soak up the flavors. I recommend letting the chicken marinate for at least an hour, but you can let it soak for up to 24 hours if that’s easier. Aside from the marinade you just need a couple of sweet peppers and a red onion to go with the chicken. Just alternate between veggies and poultry and you’re all set. I made these kebabs with my stove in mind. We live in one of the rainiest cities in England and it’s not exactly conducive to lighting up the BBQ. That being said, you can easily adapt this recipe to make on the grill. The recipe instructions are basically the same. Just fire up the grill to a medium high flame and grill for about 10 minutes, rotating every few minutes. Easy! I hope you enjoy these lemon chicken kebabs as much as we did! Enjoy! 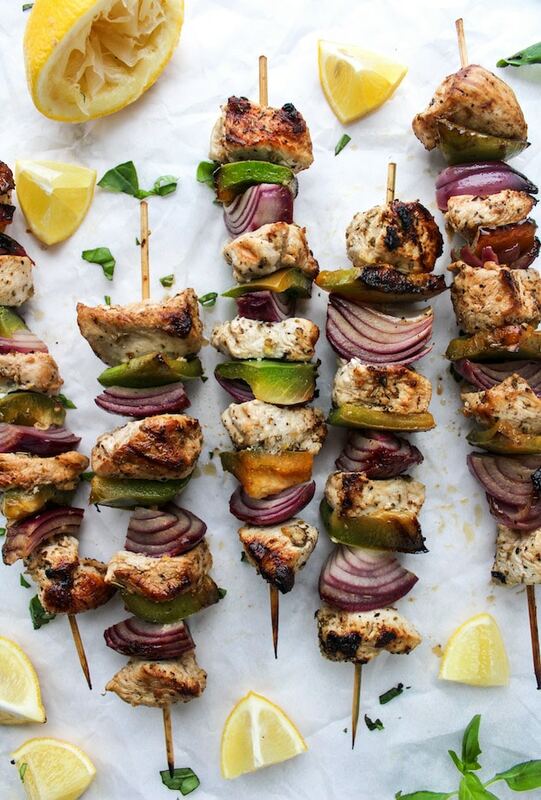 Don’t forget to #asaucykitchen on instagram if you make these Greek Lemon Chicken Kebabs. We love seeing what you make! You can also post your pictures to our facebook page! If using wooden sewers, soak them in water for at least an hour before grilling to prevent them from burning. Add all of the ingredients needed for the marinade to a small bowl or measuring cup and whisk to combine. Pour the marinade inside a large zip lock bag. Add the chicken pieces to the bag and squish the bag to coat the chicken. Seal and let marinate the chicken marinate for at least an hour and up to 24 hours. When ready to cook, heat a griddle pan or cast iron skillet with a fitted lif on medium high on the stove top. Add a little oil to the pan. Wet your fingers with a little bit of water and flick it onto the pan. When the oil sizzles after touching the water you know its warm enough. A hot pan will sear the chicken to give a grill like finish to your meat. Thread the chicken pieces, peppers, and onions onto the skewers alternating between the chicken and vegetables. When the pans are hot, add the skewers to the heat. Cover and let cook for about 5-7 minutes before turning the skewers over. Cook on all sides until done. This should take 15 minutes tops. When done remove the skewers from the heat, let rest for 5 minutes and serve with additional lemon slices if desired. Thanks Lisa! So glad to hear it! Ok. This was really good. I have a very fussy eater to feed, and he even loved this dish. This is now my go to for greek chicken. Absolutely delicious and so moist. Awesome! So glad you like it. Thanks Mark! Thanks Cara! So glad you liked them! Loved this chicken recipe!!! So good with rice pilaf and Greek salad! Will definitely make it again. Yay! So glad you liked it 🙂 Thanks for coming back to leave a comment/review letting me know how it went! This is a super fun idea twice over! And I love the greek flavors!